Losing a job. Not getting an interview. Equating our job title or salary with our value as a person. These are all ways that our self-esteem can be tied, erroneously, to our career. Sometimes we fall into the trap of equating work-related events and status with our self worth. Even though we all know that saying “It’s not personal, it’s business”, who hasn’t felt personally slighted by getting passed up for a promotion or getting laid off, even if you are one of many in your company downsize? Positive recognition as Sales Manager of the Month or a glowing review of your product can also affect how we are feeling about ourselves, too. The danger lies in thinking that our jobs are a reflection of who we are as a person. Ironically, I think it’s really the other way around – that how we feel about ourselves as people has a much bigger impact on our work and job performance. When we are confident and feel good about ourselves, generally, we show up to work happy. When we are relaxed and self-assured, we naturally want to do good work, and our relationships with co-workers, clients, even our grumpy boss go more smoothly, if only because we feel good, so our feathers don’t get ruffled as easily. We are more able to think creatively, think on our feet, and take well calculated risks because we feel valuable overall, and thus valuable on the job. I work with job seekers, and I can often tell when someone is struggling with attaching their self worth to their current state of joblessness. Job searching can make us feel uncertain, fearful, or resentful – all examples of self-esteem sabotaging emotions. We can perceive a rejection even where none may exist, in losing a job and during a job search. For example, it can be a blow to our egos to be out of work, even if we lost a job through no fault of our own. Or, we think we’re a shoe in for a position and we don’t even get called for an interview. We’ve gone to round three in the hiring process and aren’t selected in the end. These are very real disappointments, and yet, we really have no idea why things worked out as they did. Remember, business can be a strange animal. Jobs gets posted externally when the intention from the beginning is to hire internally. Secondary skill sets, personality fit with existing team members, and yes, that good old networking system also come into play. Your past experience may be an exact match for the posted requirements, but your competition may have experience with a rival company, or be the sister-in-law of the VP’s neighbor. The point is, there are reasons and situations you know not of. Don’t worry about these things. We do our best, and we let it go in trust that ‘all works out as it should’. Maintaining that trust can be particularly challenging during the emotional, financial, and mental strain of being unemployed. Here are some fairly simply things you can do, whether we are currently employed or looking for work, to keep feeling good about ourselves within, and outside of, our career life. Maintain hobbies/personal interests & activities outside of work. Simply put, take time out for fun! Be who you really are at work. Avoid having one ‘work persona’ and one ‘the rest of my life’ set of values. The split causes much confusion, and feeling ingenuine will never bolster self worth. 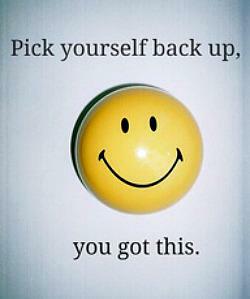 Meet with a coach/support person or job club at least once a week to help keep you on track, positive, and realistic. Choose someone you KNOW WILL BE SUPPORTIVE – don’t go looking for courage and relief from your own anxieties from someone who is habitually fear-based, sees the glass half empty, and hellfire and damnation lurking at every corner. Avoid these well meaning but potentially self-esteem bashing people. Give yourself credit by setting and tracking progress on daily/weekly job search goals (i.e. I will apply for 2 jobs/day; research 2 new companies each day etc.) The chart full of check marks can give a real sense of accomplishment and pride that you are working diligently and are focused on re-employment. By combining a grounded spiritual practice with practical action-based strategies for keeping balanced and realistic in our work and lives, we can create a state of self esteem that is interwoven throughout our work and the rest of our lives.